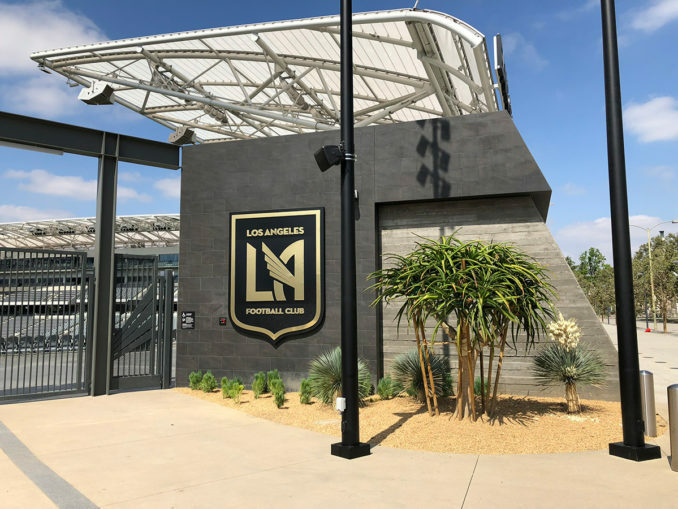 Located within historic Exposition Park, Banc of California Stadium provides a home to the Los Angeles Football Club (LAFC) – L.A.’s own Major League Soccer (MLS) team. 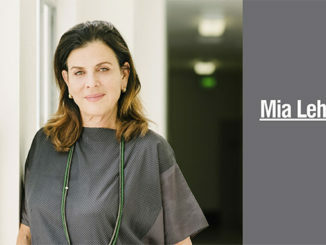 Studio-MLA developed the site design concept to enable a highly visceral fan experience while successfully blending into the overall setting of Expo Park. 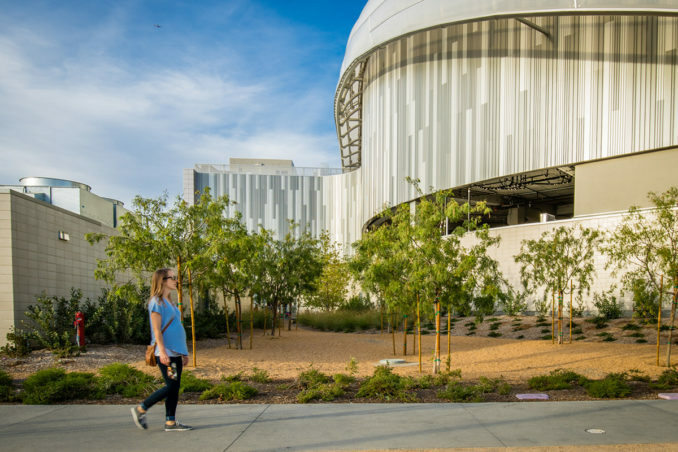 Working closely with the team owners, design team, and the surrounding communities, Studio-MLA’s vision transformed the 16-acre former LA Arena site into an iconic facility for world class sporting and entertainment events. 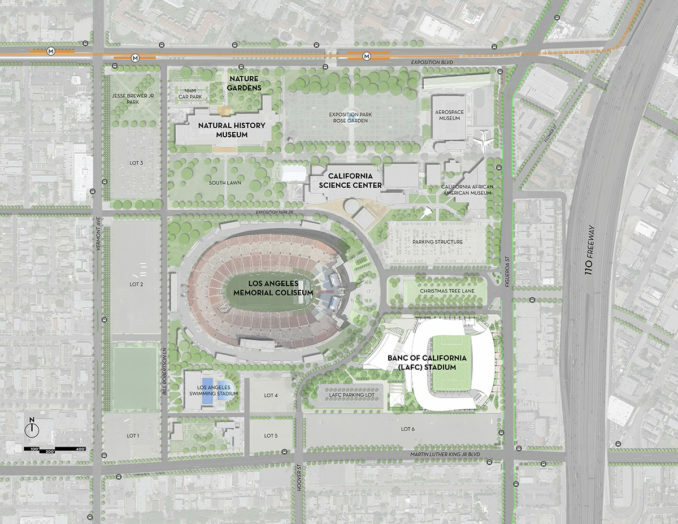 Exposition Park’s historic context and many cultural facilities, including the Los Angeles Memorial Coliseum, Natural History Museum, CA Science Center, African American Museum and future Lucas Museum for the Narrative Art, informed the site’s seamless integration and expanded the Park’s role as a destination. 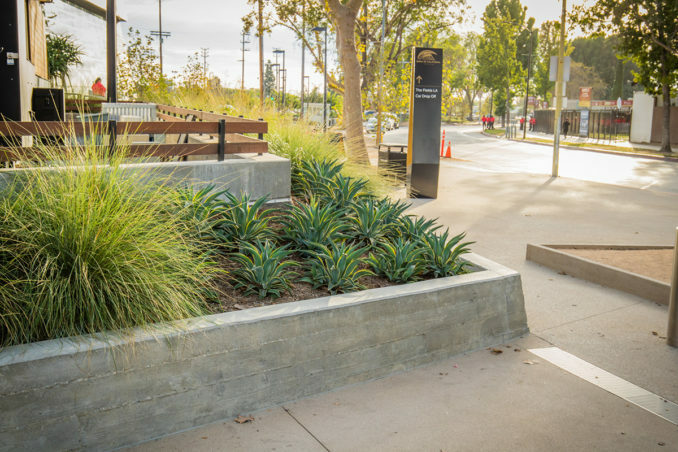 The legacy of the Park is oriented around the Coliseum, with primary access from Figueroa Street and circulation about a central lawn panel that includes formal tree planting of cedars and sycamores framing the procession. 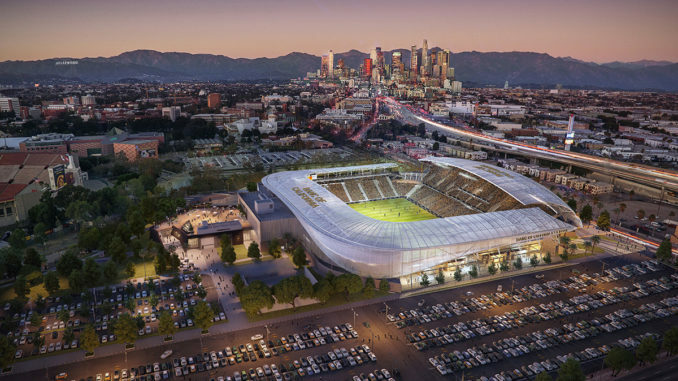 LAFC ownership recognized the importance of the site and its contribution to the legacy of the Olympics, hosted in 1932 and 1984, and its position as a primary gateway into downtown Los Angeles. 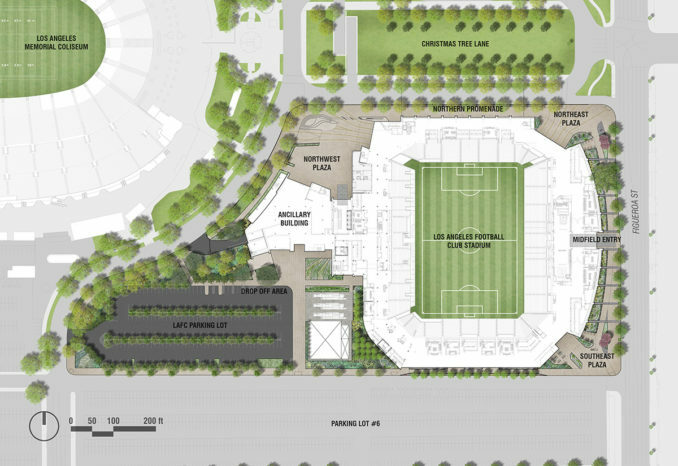 A series of entry plazas were identified early in the design process to curate the arrival experience and contribute to the visual identity of the Stadium. 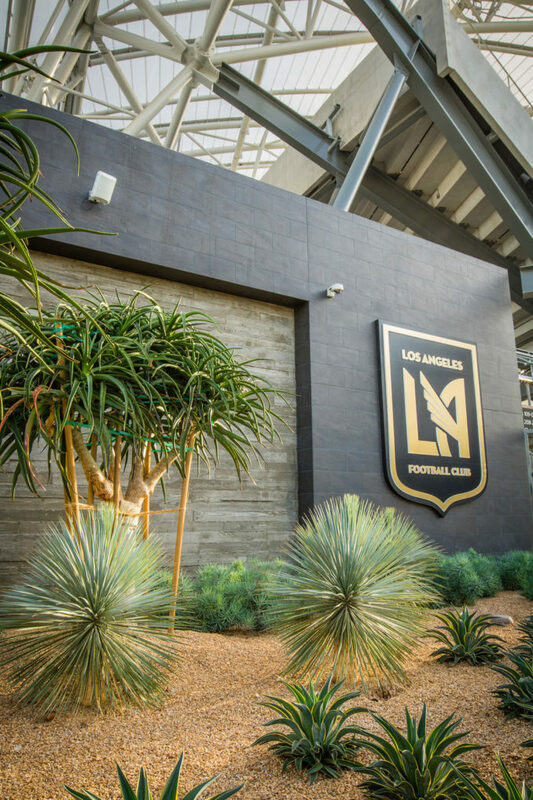 The LAFC brand draws inspiration from the Art Deco movement and to the City of Angels as place of flight. 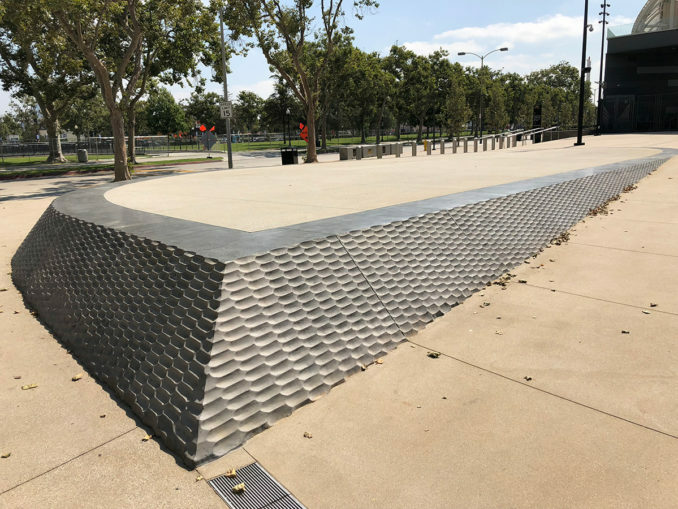 A concerted effort was made to denote the significance of the northwest corner of the site through a small platform – called the “flight wall” – wrapped in a unique texture that bridges old and new inspirations. 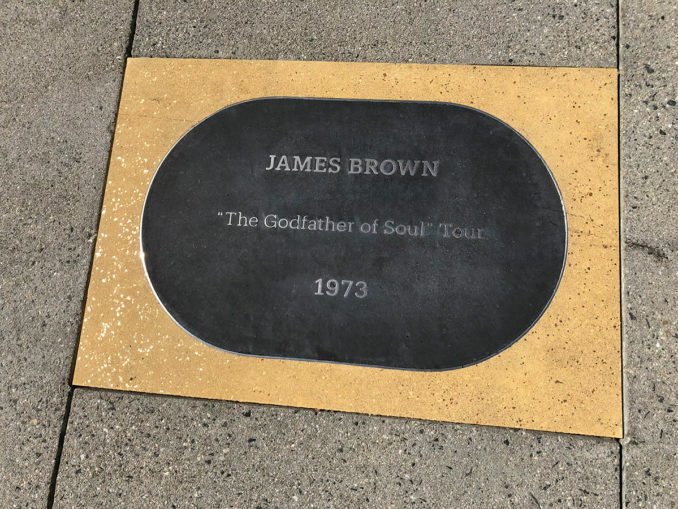 The cast-in-place concrete wall was constructed with a custom form-liner. 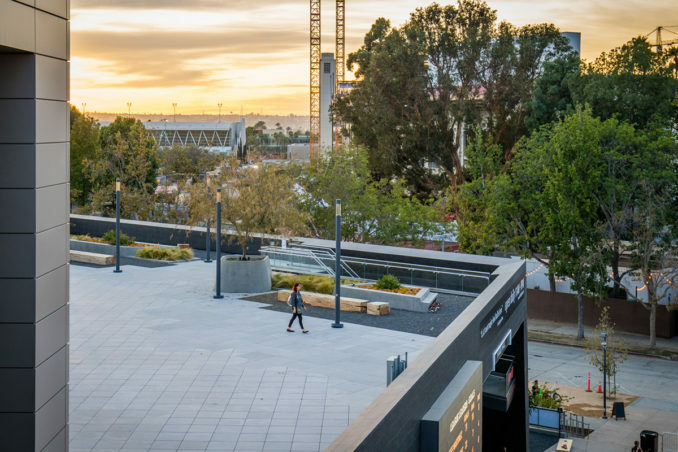 This location being most proximate to the Coliseum makes for a key location as an entrance to the building as well as a focal point for park visitors. 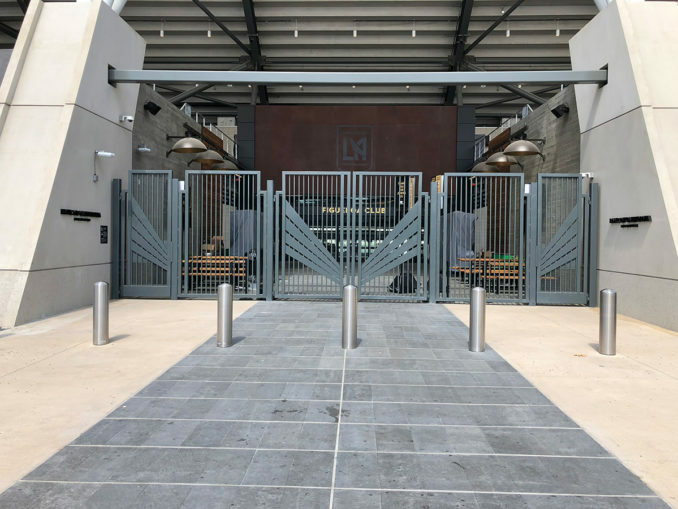 The NW Plaza is designed to serve as an extension of the stadium, offering needed space for fans to filter through the entries while providing an outdoor eating venue, exterior wood deck in conjunction with the newly opened “The Fields LA”; a L.A. based curated food experience. The flexibility of both game day and non-game activities provide year-round interest to the community. 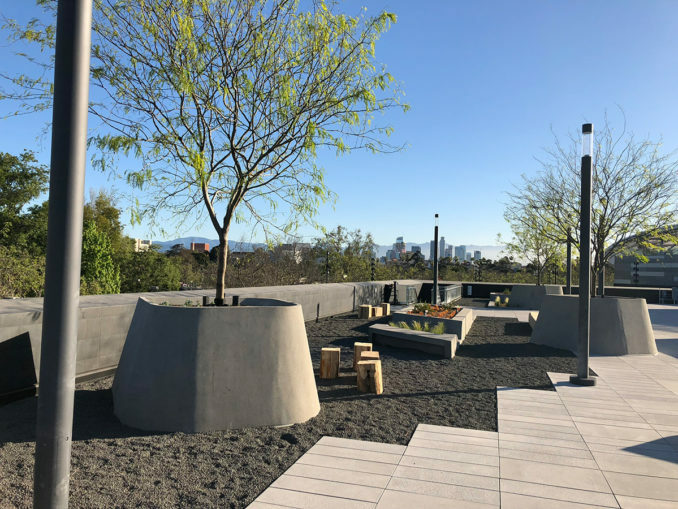 Above the ground plane, Studio-MLA designed a publicly accessible rooftop terrace and garden on the roof of Fields LA with a large flexible event space that extends the club level lobby interior space outdoors to take advantage of the panoramic views over Expo Park and to Downtown LA. 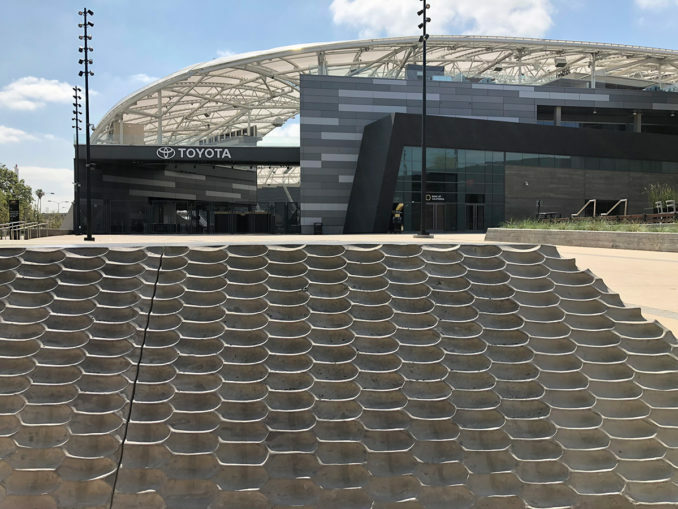 The terrace is large flexible event space supported by a geometrical arrangement of pedestal pavers that is accentuated by a series of large trees set amid lineal planters adrift in crushed stone. 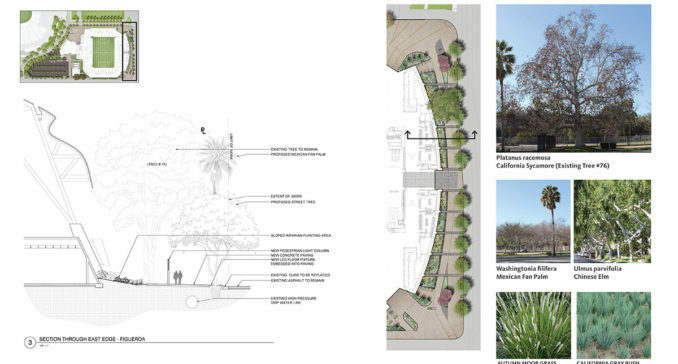 A selection of native Oak and Sycamore trees, destined to be removed for construction, were identified by the landscape architect to be milled and incorporated as large-scale site furnishings. 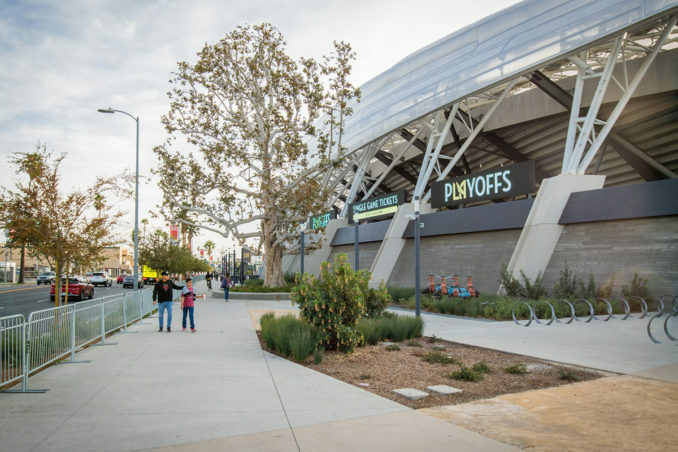 The streetscape design for Figueroa Street promotes a highly walkable, bikeable address for the Stadium and serves as a primary connector to the surrounding neighborhood. 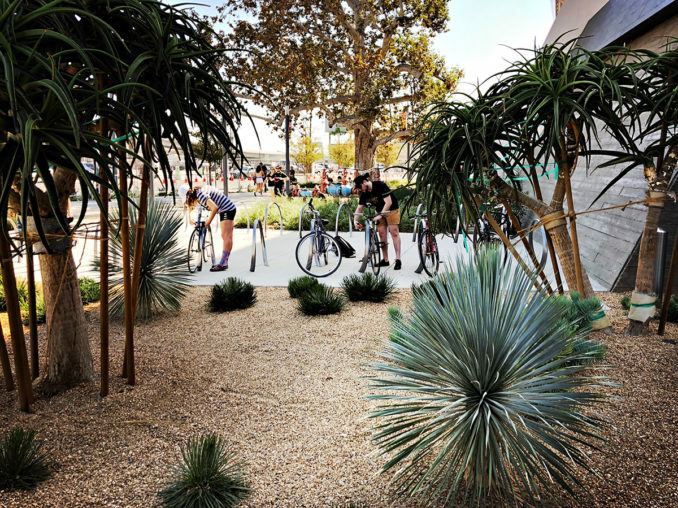 A series of Chinese Elm shade trees provide climate comfort along the breadth of the frontage while Mexican fan palms punctuate the corner plaza and midblock entry, amplifying the façade of the building and orienting fans and visitors. 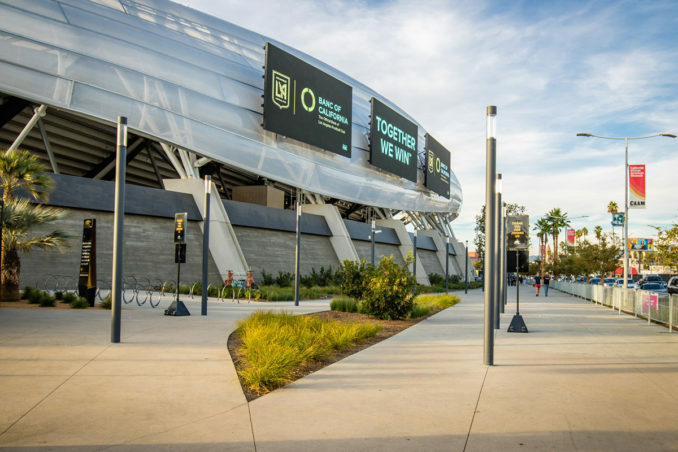 The urban edge is reinforced with a series of columnar pedestrian lights and series of pixelated permeable pavers extending the rhythm of the Stadium’s columns out to meet the street. 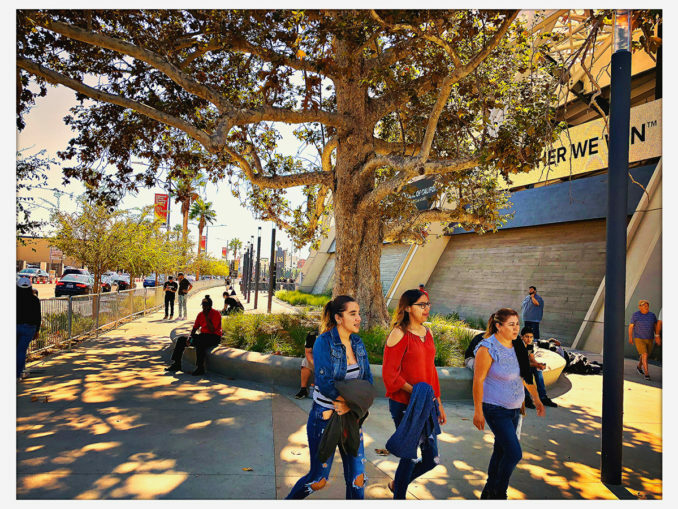 Careful effort was made to protect and incorporate an existing California Sycamore tree that was traced back to the origins of the Expo Park from the 19th Century. 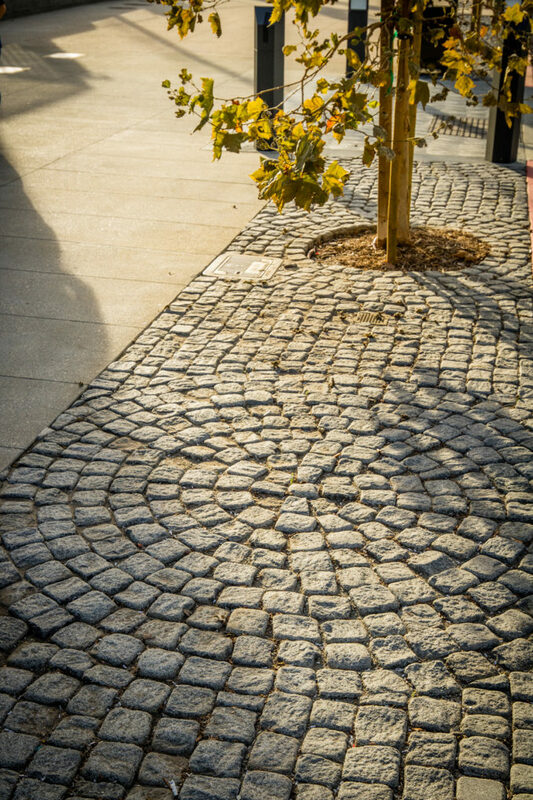 During construction, the planter was modified to avoid conflicting with the tree’s primary root structure and the original circular geometry was expanded north and south into a pure ellipse. 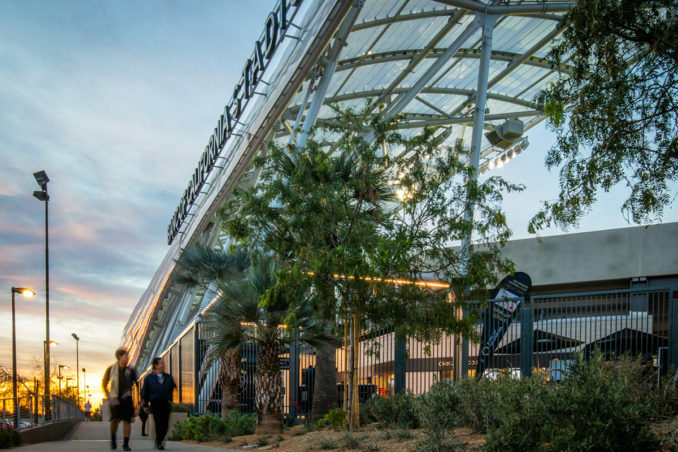 This historic tree has become a memorable destination to convene before or after the game as well as provides a respite for the neighbors and visitors to Expo Park. 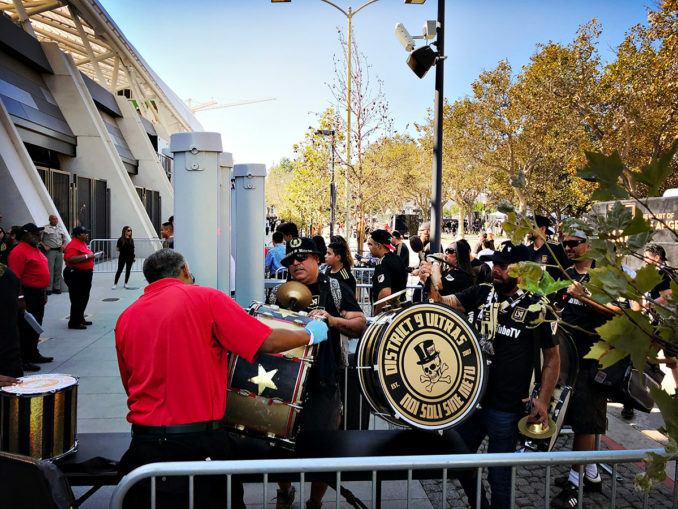 The north edge, known as “Supporter’s Lane”, provides space for the ‘3252’, LAFC’s most diehard supporters who occupy the North End of the stadium’s standing seats (3,252 total) where they convene in a drum rally and make their ceremonial entrance into the north gates. 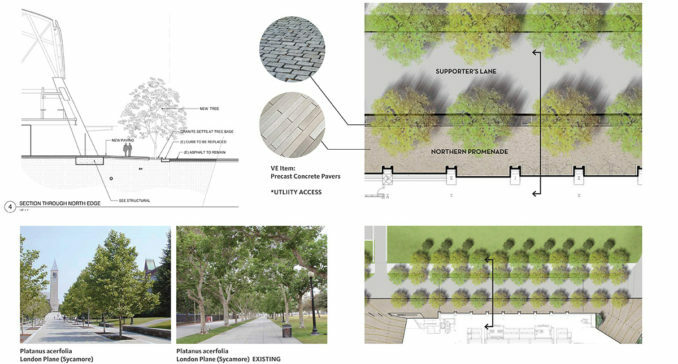 The formal planting of the London Plane Sycamore trees historic to the planning of Expo Park along the north edge was re-established and finished with an intricated pattern of granite setts; creating a durable yet permeable edge to the building. 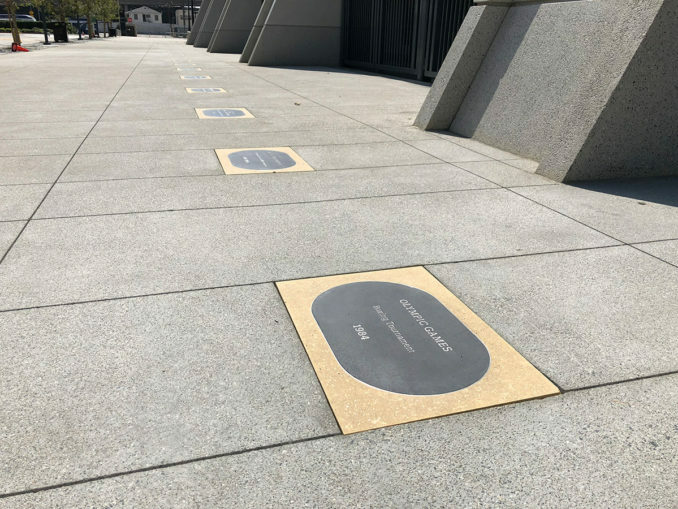 Along the north promenade, 54 precast concrete medallions conceived by graphic artist Sheila Levrant de Bretteville, commemorating the fifty-four years of events that took place at the L.A. Memorial Sports Arena – from Nixon’s opening address in 1959 to Bruce Springstein’s final tour in 2016. 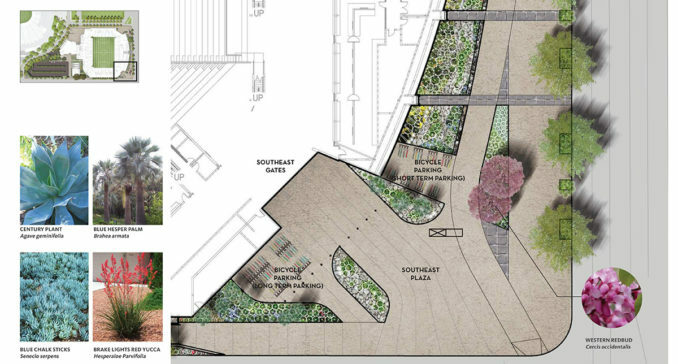 Grading and drainage were carefully incorporated into the design to enable the highest potential to capture, treat, and collect stormwater on site for local infiltration into the ground water supply. 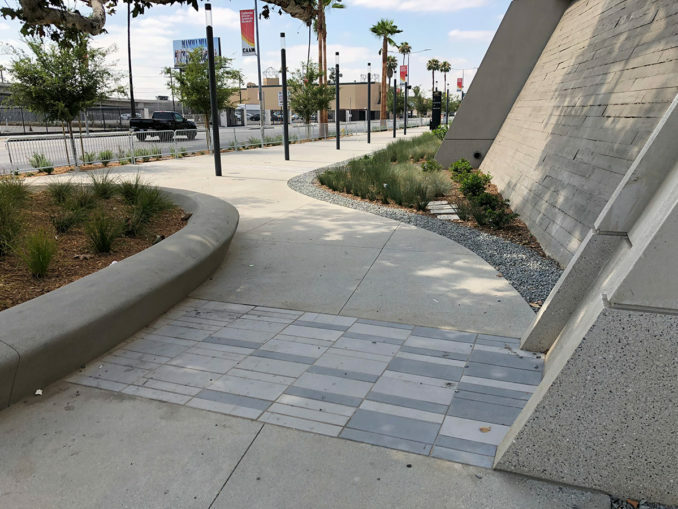 With the approach to surface level drainage and high percentage of permeable paving options, many of the subsurface drainage elements were able to be removed. 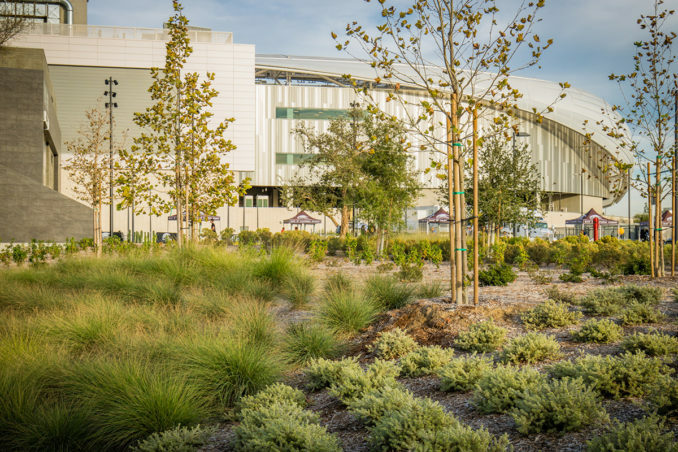 The perimeter landscape captures and treats stormwater runoff in planting areas in an integrated approach that creates a comfortable and welcoming pedestrian environment. 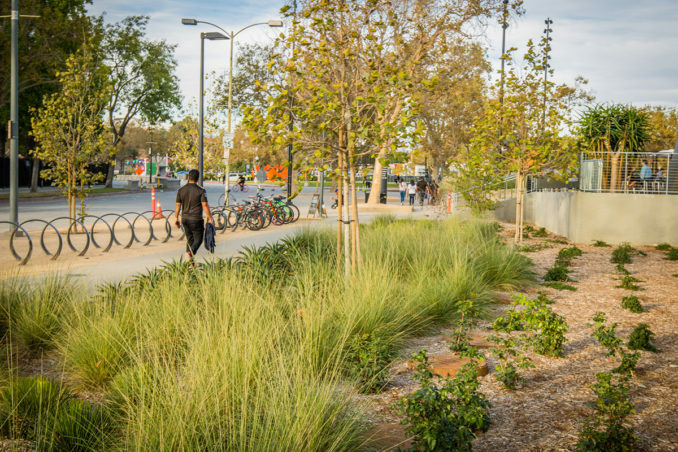 Larger paving areas were designed to direct surface runoff through planting areas designed for pretreatment, biofiltration then directed to detention basins like the Southwest corner further accentuated as a bosque of Mesquites. 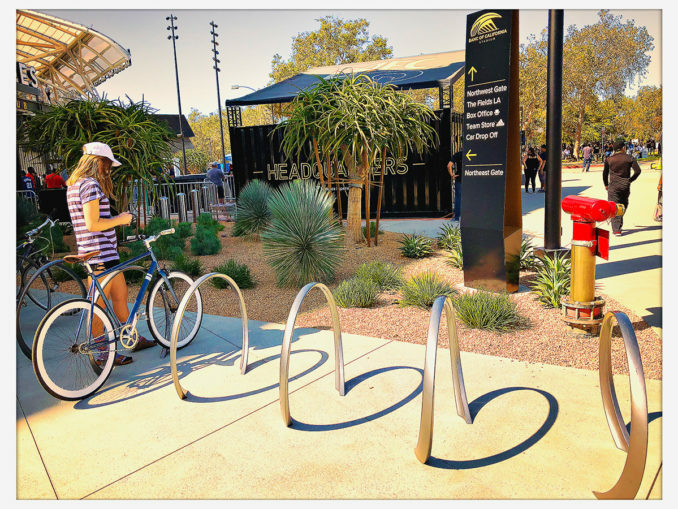 High ASR finished paving was selected to reduce heat absorption and improve user comfort. 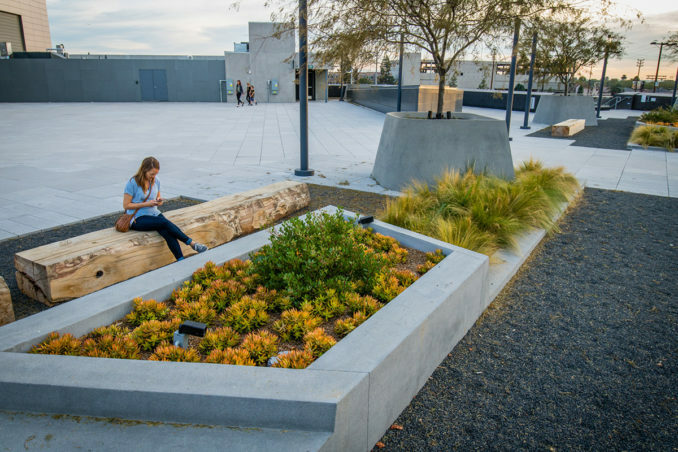 The plant palette focuses on California native species, with consideration for the varying microclimate around the building as well as celebrate the team’s identity. 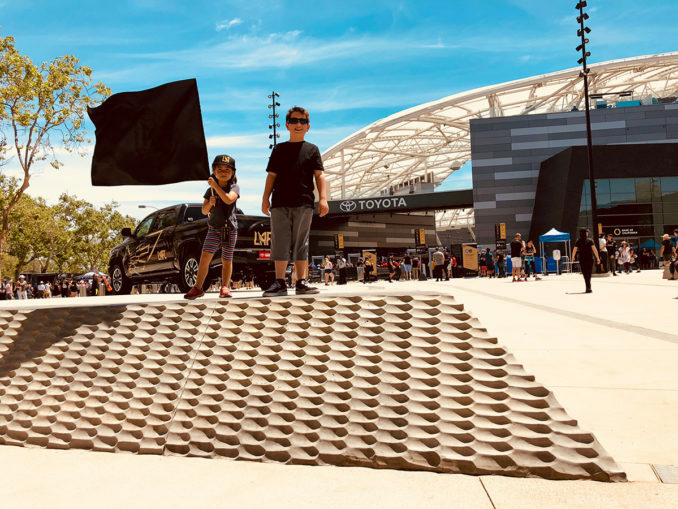 During the Stadium’s inaugural year in 2018, LAFC made history through its dedicated fans, record-making season as an MLS expansion team, playoff run, and recognition as an award-winning project – a new icon amidst Los Angeles cultural and sporting venues. 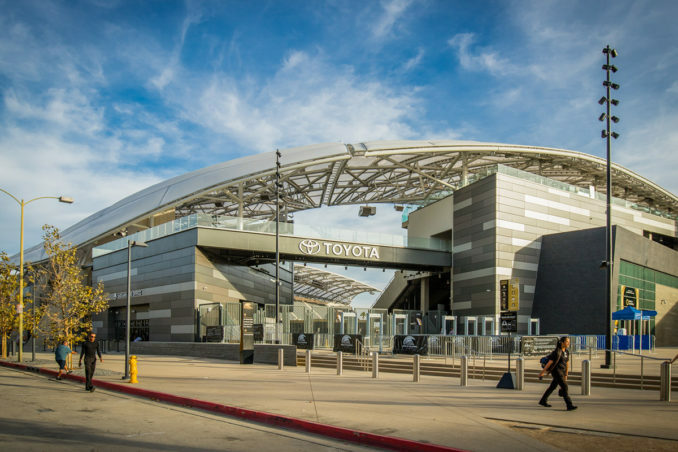 The legacy continues in Expo Park as Banc of California stadium has been selected to host several international sporting events including Copa de Oro, the World Cup, and the 2028 Olympics.